AC mitigation prevents voltage spikes, protects pipelines from corrosion and protects workers in areas where the pipeline parallels high voltage transmission lines. Pipelines that parallel overhead high voltage AC transmission power systems are subject to AC interference. 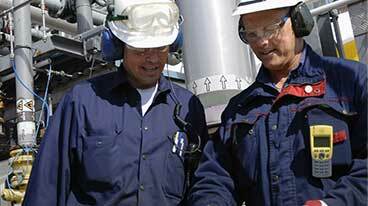 AC interference has several potential adverse impacts on the safety of personnel and pipeline integrity. Assuming that these conditions exist, there are several measures that can be taken to mitigate the AC interference present on a pipeline. These AC mitigation strategies are detailed in various international standards including NACE SP0177-2014 Mitigation of Alternating Current and Lightning Effects on Metallic Structures and Corrosion Control Systems. 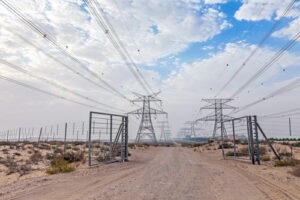 One of the primary concerns with high voltage AC transmission systems parallel to buried pipelines is the risk that a fault condition at a transmission tower could result in the rapid discharge of fault current near the pipeline. This could lead to direct current arcing in soil – rare but very damaging. More common is the rapid ground potential rise that subjects the pipeline coating to large voltage gradients that result in coating damage. Fault shielding is a suitably designed grounding system that is installed between the tower footing and the pipeline that acts to shield the pipeline and shunt harmful currents away from the pipeline by providing a low resistance path to earth. This typically takes the form of a parallel shielding wire, either copper or zinc, connected to the pipeline. 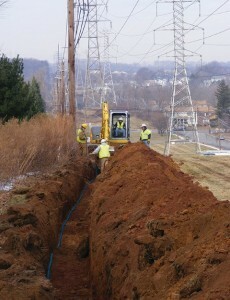 When high levels of AC voltage are present on a pipeline, either during a fault condition or as the result of an inductive coupling during normal steady-state operations, personnel in close proximity to and/or touching any above ground or exposed appurtenance are at risk for electrical shock step or touch hazards. Installing gradient control mat, which is a system of buried bare conductors, typically galvanized steel, copper or zinc, connected to the structure, provides localized touch and step voltage protection by creating an equipotential area around the appurtenance. Lumped pipeline grounding systems consist of shallow or deep localized grounding conductors that are connected to the structure at strategic locations to reduce the AC voltage level along the pipeline. This provides protection to the structure during steady-state or fault conditions from nearby electric transmission. Gradient control wire grounding systems function the same as the lumped grounding system. With this type of system, long continuous grounding conductor(s) are installed horizontally and parallel to the pipeline. They are strategically located and sized to reduce the AC induced voltage along the pipeline during steady-state or fault conditions from nearby electric transmission. For mitigating high levels of AC induced voltage along a pipeline, gradient control wires are the most common form of AC mitigation. Hybrid systems that combine lumped grounding systems with gradient control wires are also common. Regardless of the type of pipeline grounding system used, all of these AC mitigation approaches involve installing a grounding device to the affected structure to allow AC induced current and fault current to be quickly discharged off of the pipeline. Prior to installing an AC mitigation system, it is common to use a complex AC modeling software to evaluate the impact of fault currents and estimate the steady state induced currents that can be expected along the pipeline. 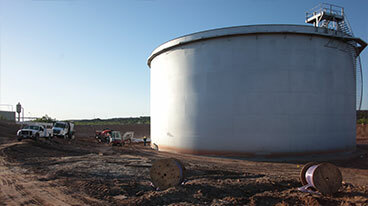 This information is used to determine the quantity and location of mitigation required based on numerous factors, including the resistivity of the soil, the physical characteristics of the pipeline, the operating parameters of the HVAC transmission system and the spatial distances between them. Based on a thorough assessment of the pipeline and high voltage AC transmission system interaction, including modeling results when available, an AC mitigation system is designed by experienced engineers familiar with the mitigation strategies detailed above. This engineered AC mitigation system would detail the quantity and location of grounding installations required for a specific application. MATCOR’s MITIGATOR is an example of this type of AC mitigation system. Enhanced surface area – conductive backfills such as carbon or conductive concrete are used to effectively increase the surface area of the grounding conductor reducing the overall resistance to earth. Corrosion/Passivation Protection – some backfills are designed to protect the grounding conductor from corrosion or passivation of the conductor that could adversely affect the life or impede the performance of the grounding conductor. Hydroscopicity – some hygroscopic backfills readily attract and retain water from the environment, helping to maintain a low uniform resistance around the grounding conductor. These devices are almost always used in conjunction with AC mitigation systems and are usually installed wherever the grounding system is connected to the pipeline. These devices are designed to allow AC current to flow off the pipeline during steady-state or fault conditions while blocking all DC current. This effectively isolates the pipeline’s cathodic protection (CP) system from the AC mitigation system, preventing the mitigation system’s grounding conductors from taking CP current from the pipeline. MATCOR provides complete AC Mitigation solutions including design, supply of materials, turnkey installations and comprehensive testing services. Have questions or need a quote for an AC mitigation system or services? Contact us at the link below.